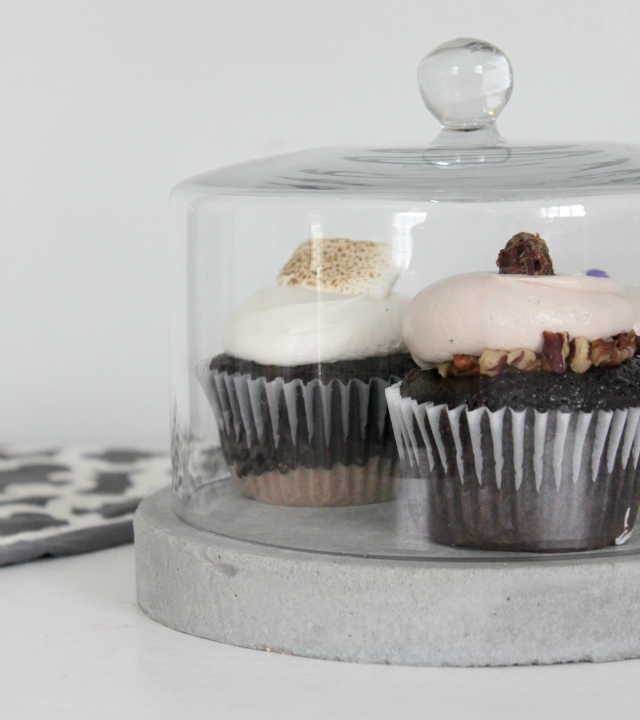 I love making decor that can go in my kitchen-especially cake stands and cake plates. I have seen cement cake stands and love the industrial look of them. I had this lone glass cloche that I got on clearance from a craft store. You can find some here. I was trying to decide what I should do with it and thought that I could make my own cement cake plate and use the glass cloche with it. 1. Mix your cement and place inside the lid of a cardboard circle container. I wanted my cake plate thin so I just used the lid. Let the cement set, a few days) When it's dry, remove the cardboard around the cement. Mine came out easily but if you have difficulty, run it under water to peel it off or use sand paper to get any remnants off the cement. 2. Spray the cement with the sealer. Follow the directions on the sealer. This particular sealer is used for granite countertops so it is food safe and makes the cement plate waterproof. And that's it. I just love it and it was pretty easy to make. Now I have a use for this little glass cloche.